Copyright © 2011 by Brian Fraser. All rights reserved. The time is long overdue for America to find a new approach for solving the nation’s nuclear waste problem. That is why I was joined by Senator John Ensign in proposing the creation of a Blue Ribbon Commission of experts to make credible, scientifically sound recommendations for a new approach to nuclear waste. You don't need official permission from any governmental agency to demonstrate the basic principles of neutralizing radioactive waste that are described in the essay below. You just need enough courage to annoy a few authority mongers like those that were around a couple thousand years ago. "And they said to Him, "By what authority are You doing these things? First, I needed a Geiger counter, one that I could hook up to a computer The RM-60 Radiation Monitor from Aware Electronics (http://www.aw-el.com/) met my needs very well. It has a Geiger-Mueller tube that has an alpha sensitivity of 2.5 MeV, 80% at 3.6 MeV, a beta sensitivity that is 35% at 50 KeV, 95% at 300 KeV, and a gamma & X-ray sensitivity of 10 KeV. The unit can be hooked up to a PC and the software handles the radiation counting. The files can also be converted to a Comma Separated Variables (.CSV) list and imported into an Excel spreadsheet for more extensive data analysis. The user manual was also very informative and a pleasure to read. Second, I needed some radioactive waste to play with. It turns out the stuff is pretty hard to get J. But actually I wouldn't want it anyway. It is just too dangerous to have around. I needed something a lot safer. It turns out thorium will work quite well. So will uranium. Therefore I bought some thorium and uranium nitrates from a chemical laboratory supply house (no NRC license is needed for these items in small quantities). Thorium 232 (90Th232) has a half-life of 14 billion years. That is short enough to make a sensitive Geiger counter crackle vigorously, but long enough to be very safe for careful experiments, the main danger being inhalation of the dust. Uranium 238 (92U238) has a half-life of 4.5 billion years and uranium 235 (92U235) has a half-life of 0.7 billion years. The latter isotope represents less than 1% of natural uranium, but as you can see from the half-life, it is about six times more radioactive than the 238 isotope. Both isotopes are significantly more radioactive than thorium and would be useful in advanced experiments. All isotopes decay into "daughter products" which in turn are radioactive. The decay results in the "thorium decay series" and the "uranium decay series". Radioactive series eventually terminate in a stable, non-radioactive nuclide like an isotope of lead or bismuth. 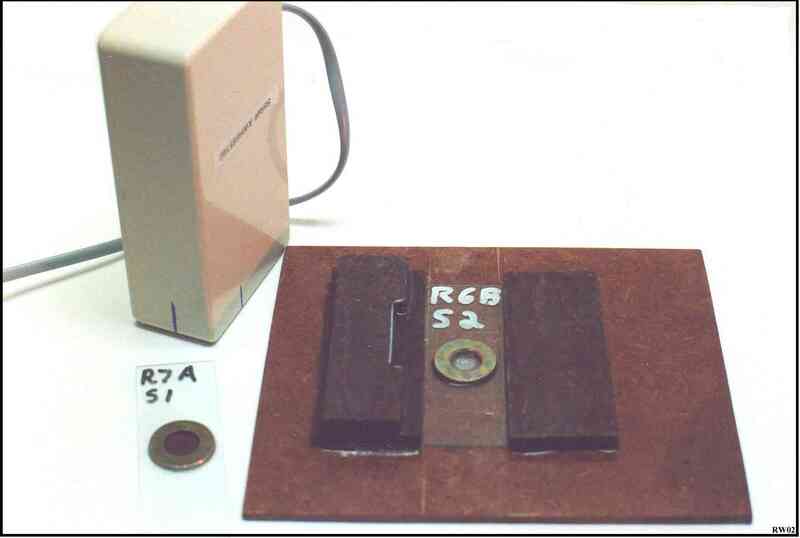 These are the basic materials and tools required for these experiments. 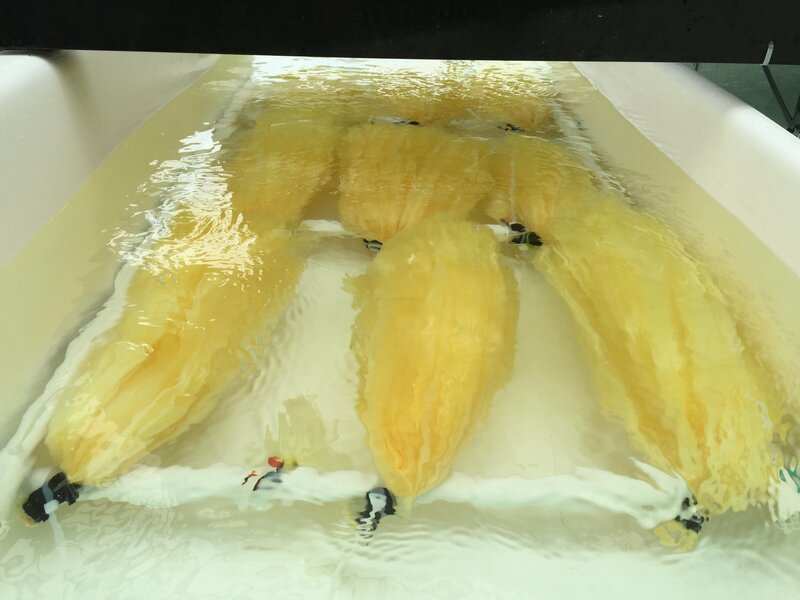 The yellow crystals in the plastic bag are uranium nitrate hexahydrate, but most experiments can be done with the safer thorium nitrate tetrahydrate. The RM-60 counter connects with a computer through the serial cable. Third, I needed some fixtures to facilitate radiation counting. The fixtures would ensure uniformity and repeatability, which in this kind of research are extremely important. The bulk of the work in fact consists of hours and hours (or several days) of radiation counting. Running the reaction cell is only a minor part of the effort. Counts must be done both on electrodes as well as the liquid contents of the cell. After the reaction cell is turned off, I make a similar set of "after" slides with the same technique. Electrolysis uses up a little bit of the water and some may have to be added to bring the cell back to the original dilution (less the 36 drops for the "before" samples) so that a valid comparison can be made. Also, the liquid may have a radioactive precipitate in it and so the liquid must be well stirred before taking samples. The idea, of course, is to compare the before and after samples to see how the radioactivity has been affected by the electrolytic process. Both the intensity (counts above background level) and the shape of the decay curve are critical things to measure. You'll see some examples later. After I am done "counting the slides" I cover the washer with a piece of cellophane tape, place the slide in a little plastic soap box (the kind used for travel) with the other slides, and store the box in a safe place. This is a precaution against contaminating my surroundings with radioactive dust. The slide counting fixture helps to position the geiger tube directly over the hole in the washer which contains the radioactive material. Slides are labeled with run number, whether they are before or after the run, and the slide number. Computer file names also include a measurement pass number (such as R6B-S2P1.RAD). No other slides or radioactive materials should be near the counter during a counting process. Unneeded slides are normally stored in a little plastic soap box and kept in a safe place away from the counter. 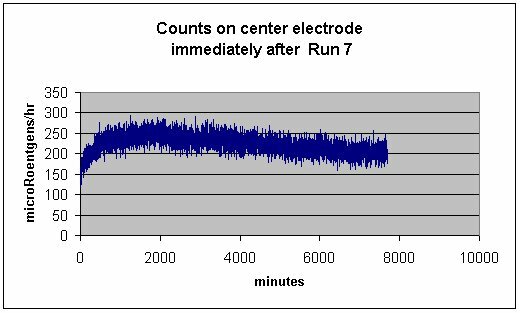 This is what the computer monitor looks like during counting (an electrode in this case). At the far right side of the screen, the blue bar shows that 235 counts have been received in one Time Base Unit (one minute in this case). The display scrolls leftward as counting continues (usually for days). Electrolyzed radioactive materials often show periodic variations in the bar graph display, as well as in the data plots. Fourth, I needed an electrolytic reaction cell and a power source to run it. I designed the cell shown in the photo while I was walking around in a hardware store. It is basically an ordinary Ball wide-mouth canning jar mounted between two blocks of wood that have been coated with marine epoxy. Liberal amounts of silicon seal are used for cushioning or sealing. The electrodes are 1/8 inch diameter stainless steel rods, which each go through 3/16 inch stainless steel tubes. This allows the electrodes to be removed for counting, cleaning, safe storage, or using a different type of metal for the electrode such as tungsten. The cell is typically run with 1 gram of thorium nitrate tetrahydrate dissolved in 150 ml of distilled water. It may be electrolyzed with alternating current (AC) or direct current (DC). The threaded rods and nuts are part of a "positive control" scheme intended to keep this ungainly contraption in one piece when it is being moved around; this reduces the likelihood of inadvertently splashing hot, radioactive liquids or dropping the glass jar. The clamp nuts are removed before the cell is energized. Little sand bags (not shown) are placed on top to keep the lid sealed to the jar (the center area of the lid has been cut out with an electrolytic etch technique that uses salt water and a car battery charger). This is my general-purpose electrolytic reaction cell. It has a provision for a reflux condenser that allows higher power levels to be investigated without boiling off the electrolyte. It is placed inside a 5 gallon plastic bucket before power connections are made. This is a ground tungsten TIG welding electrode that has been partially sheathed in glass and silicon rubber sealant. It is made by injecting the glass tube half-full with sealant, closing off the full end with a finger, and pressing the electrode through it from the other end, causing the sealant to extrude around the electrode. The green marking on the right end means that this electrode is pure tungsten. A red marking would mean 2% thoria alloy, yellow means 1% thoria, blue means 3%, brown means zirconia. Lanthanated and ceriated rods are also available. Tungsten does not corrode as easily as stainless steel. It is also useful in experiments requiring cathodes of high atomic weight. Before a run, the cell is placed inside a 5 gallon plastic bucket and anchored with another sandbag at the base. The bucket is intended to confine glass shards if the cell explodes during operation (electrolysis will generate potentially explosive combinations of hydrogen and oxygen). The clear packaging tape around the jar will also help to reduce the mess. A hole in the lid allows the cell to be connected to an air-cooled reflux condenser, which is just a four foot piece of CPVC pipe. It is open to the atmosphere at the top end and merely condenses any steam generated by the cell during operation at higher power settings. The vinyl tubing, which connects the pipe to the cell, has some stainless steel scouring pad loosely strung through it to demist any vapors from the liquid boiling below it. There is also a small view port which is covered with plexiglass. And yes, I run it in the bath tub (on top of a couple of car floor mats). I like having a wall and a door between me and something that could explode. The bathroom does not have pedestrians or inquisitive cats walking through it either. And the power comes from an outlet protected by a Ground Fault Interrupter (GFI) which should keep me from getting electrocuted if, in a moment of thoughtless inattention or complacency, I do something stupid. The cell is powered by an old Superior Electric Powerstat. This is an autotransformer that can supply 0 to 140 volts AC at 15 amps (very overpowered for what I am doing). A small electric outlet box is wired so that a "load limiter" can be connected in series with the reaction cell. In this case the limiter is just a photo light bar with a couple of high wattage bulbs. In case of a bad electrical short, the lamps on the light bar will light up. This keeps the equipment from being damaged, the wall circuit breaker from popping open (and killing the computers on the same circuit), and me from becoming a nervous wreck. Another box contains a full-wave bridge rectifier in case I want to run the cell on DC. The cell power requirement at high voltage is estimated offhand to be 30-50 watts. As you may deduce from all the above photos, the basic equipment shown is very primitive and built from spur-of-the-moment designs and junk box parts. It is nevertheless sufficient for proving that radioactive half-lives can be shortened from billions of years to a matter of hours by a quick and simple process. For my nuclear physics amusement, I bought a 3 ounce container of Morton Salt Substitute from the grocery store and put it in front of the RM-60 counter. This salt substitute contains mostly potassium chloride instead of the usual sodium chloride. Potassium has a couple of stable isotopes that form the bulk of natural potassium: potassium 39 ( 93.26%) and potassium 41 (6.73 %). But there is also an unstable isotope, potassium 40, with a half-life of 1.25 billion years (more radioactive than uranium 238). Fortunately, it has an abundance level that is 0.0117 percent (one-hundredth of one percent) that of natural potassium. Nevertheless, its activity can be seen with a sensitive radiation counter. When I put the Morton Salt Substitute in front of the RM-60 counter, it registered about 30 microRoentgen/hr. Is this radioactivity enough to worry about? To keep things in perspective, you need to know that the average background radiation in our everyday environment is about 5 to 25 microRoentgens/hr. It comes mostly from dirt, rocks, bricks, radon gas, and cosmic rays. Inside a jet at 30,000 feet the background might reach 300 microRoentgens/hr. Overall, the average American gets a cumulative radiation exposure equivalent to 10-20 chest X-rays per year. I measured the salt substitute inside a concrete building, where the background is about 19 microRoentgens/hr. The salt shaker therefore contributes only about 11 microRoentgens/hr above background. This is really not enough to worry about, not even if you have hundreds of these things in your coat, hundreds of them in your bed, thousands of them in your house. (and if you are that fond of salt substitute, you probably have other problems you need to worry about!). See also http://en.wikipedia.org/wiki/Banana_equivalent_dose . The count level, 19 microRoentgens/hr, from the fixture is essentially the same as that for the room in general. 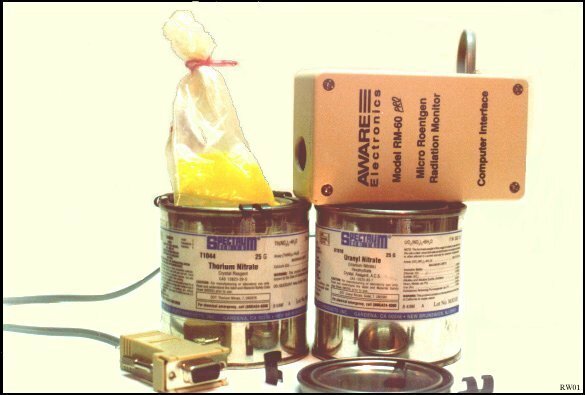 This shows that neither the RM-60 nor the counting fixture has been contaminated with stray radioactive dust. Note also that the curve is flat (albeit noisy); the background is essentially constant with the passage of time. We will later see that this observation is critically important for interpreting radiation measurements on materials that have been in the reaction cell. First, I did a couple of shakedown runs to locate equipment problems and calibrate my level of nervousness. I used common baking soda (sodium bicarbonate) as the electrolyte. The Powerstat gave me the most trouble. When I set the dial to zero and plugged it in, the circuit breaker at the main panel would pop open. I was left in the dark, and of course the computers crashed too (they were unavoidably on the same circuit). It popped the breaker in every outlet I tried, except for the particular one outlet that I used when I tested it originally! I got around the problem by adding a twenty foot extension cord and turning off a few lights. Later, during a run at higher power settings, the Powerstat would start sparking, hissing, and generating ozone. I had to take the thing apart, clean it up, and realign the rotor with the windings. After that it worked fine. The load limiter, a simple light bar used for photography, had a little surprise too. It has a 500 watt bulb and a 300 watt bulb. During a run, the 300 watt bulb would start glowing first. I thought, "This is crazy. They are acting like they are connected in series." I had forgotten that years ago I had replaced the original on/off switch with an on/off/on DPDT switch, and I wired it for a series-start, parallel-run to extend the filament life. It was now in series and so I simply switched it to parallel. Suffice it to say that practice runs can save you a lot of grief, especially if you are going to be using radioactive materials. Finally, I did a run where I decided to collect data. The cell ran on thorium nitrate, alternating current, and stainless steel electrodes. After about a half hour, I took the cell apart. I noticed that the curved electrode had a thin layer of glittering, copper colored substance on it. Tiny metallic-looking whiskers were also visible. I decided to place the electrode in front of the counter and see what happened while the liquid portion cooled down. The graph shows that the emission rate on the dry electrode starts out around 40 counts/minute (equivalent to 40 microRoentgens/hr on the RM-60) then seems to increase briefly, then decays in the pattern of an exponential curve (basically as expected), except that there seems to be some bursty, sawtooth effects as the emission rate approaches the background level (20 counts/min). 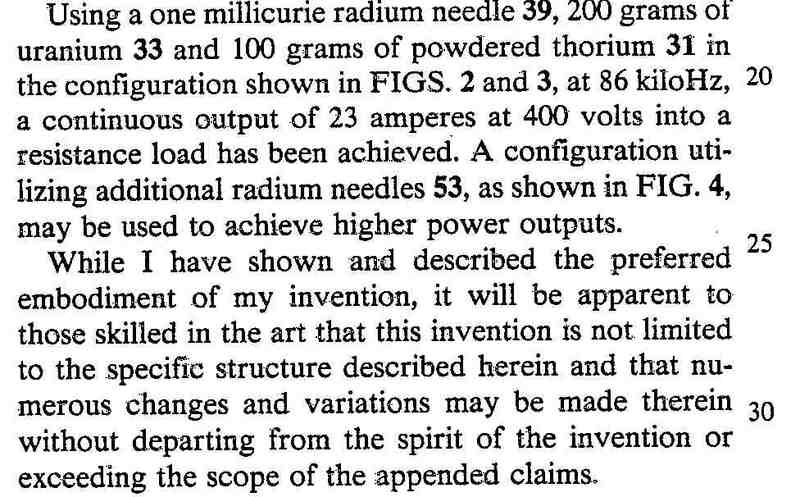 Although the radioactivity was not gone, it was clearly going, and it was not going to take billions of years either (the passage of 5 half-lives reduces the radiation by 1/25 or to 1/32 of the original; 10 half-lives would be less than one-thousandth). This one was even more of a surprise. The counting on the dry electrode began 8 minutes after the electrolysis was shut off. The emission rate starts out at about 150 counts/min and then steeply increases instead of decreases. It goes up to about 270 and then very slowly tapers off, again in somewhat of a sawtooth fashion. The counting was terminated after about 130 hours. 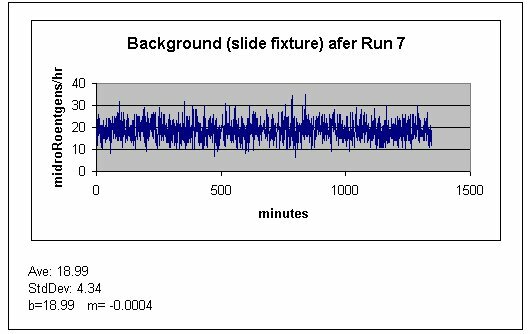 After I plotted the data, I wished that I could have seen the first 8 minutes! This leads to a working hypothesis that the electrolytic process converts thorium 232 to numerous daughter products. These are radioactive and are neutralized (in parallel) just like the thorium is, as long as the cell is operating. But when the cell is shut off, nothing neutralizes the existing daughter products. A complete radioactive "decay series" then emerges. The short-lived products cause the radiation to increase initially but after they "cook off", the longer-lived ones cause the decay curve to flatten out, although still trending downward. "Previously, it has been reported that nuclear transmutation reactions are accelerated when radioactive elements are subjected to low-level electric fields during electrolysis of aqueous electrolytes. . . . Our research investigated the codeposition of U3O8 and H on Ni cathodes, using an acidic electrolyte and a Pt anode. Then, the radiation emitted by the electroplated U3O8 was compared with radiation emitted by unelectrolyzed U3O8 from the same batch. . . . The electroplated U3O8 initially produced ~2900 counts in 3 min (April 17, 2000). This rose sporadically in steps to 3700 counts in 3 min on May 11, 2000, and it remained relatively constant at this level until the . . . measurements ended on June 8, 2000. The unelectrolyzed U3O8 from the same batch emitted radiation at a much lower rate, ~1250 counts in 3 min, and this remained almost constant over the entire period of measurement." (G. Goddard, J. 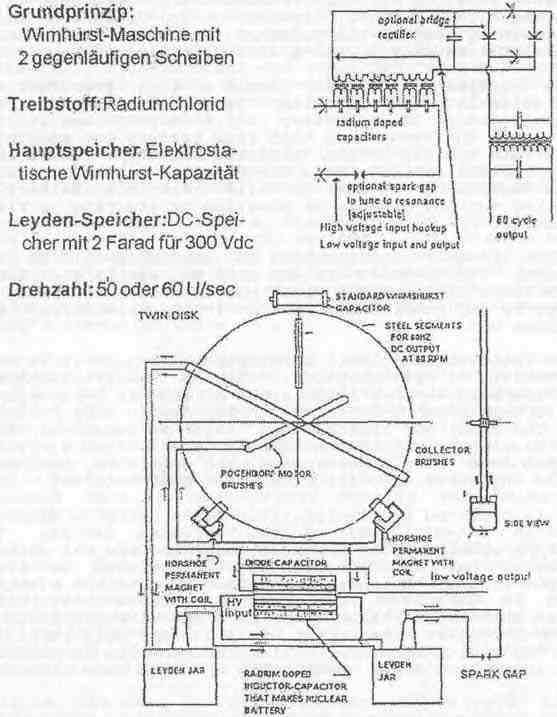 Dash and S. Frantz, "Characterization of Uranium Codeposited with Hydrogen on Nickel Cathodes", Transactions of the American Nuclear Society, 83, 376-378 (2000) ). Later they did gamma ray measurements and these showed that, overall, the electrolyzed sample was 1.7 times more gamma emissive than the unelectrolyzed sample. Note that the counts are around 50 and that the trend of the plot is flat. This is exactly what you would expect. Something that has a half-life of 14 billion years is not going to show a noticeable change in decay rate in several hours. There is no obvious sawtooth pattern either; I had worried that the cycling of the air conditioner could somehow show up on the graphs. Here the radioactivity starts out between 50-60 counts/minute (higher than the original 50) but after 1000 minutes has decayed to between 50-40, and at 2500 minutes has decreased to about 40. (During the blank range I was counting a different slide.) A week later the average had dropped to 38. There is still quite a bit of radioactivity present, and it is not decaying as fast as desired. Clearly though, it was affected by the electrolytic process, and in a manner similar to the electrode. After the run with AC and stainless steel electrodes, the liquid looked something like iced tea with copper paint stirred into it. The liquid had tiny, iridescent particles that looked like metal flecks of copper (the same stuff that I saw on the electrodes). They were fascinating to watch as they were slowly swept around in the thermal currents of the slowly cooling liquid. Copper is a transmutation product that has been seen in these kinds of cells. But I had my doubts that this was copper. There was an awful lot of it. If it got there by transmutation, its presence would represent the release of a lot of energy, but none was apparent. Did it all go off as neutrinos (which do not interact with the environment and produce heat)? Very unlikely. And I could see the particles. That meant they must be at least 40 microns in diameter (the limit of unaided vision), and if they were that big and made of metal, they should be settling out of the liquid a lot faster. But it was non-conductive. It could not be copper. (I really don't know what it is. My best guess would be a mixture of thorium and ferric hydroxides, the latter coming from corroded stainless steel electrodes). Students might ask "Can I do this experiment as part of a highschool science project?" And teachers might view it as a possible project in an honors program. So I am sure such questions will come up. Here are some things to consider. Also, expect a little hysteria when proposing experiments of this type. Parents and teachers are not generally aware that our environment contains radioactive materials like thoriated mantles in the gas lamps that might light your street, thoriated tungsten rods that are used in welding, monazite sand sometimes used in pottery, the tiny amounts of americium in smoke detectors (don't mess with it! ), the potassium 40 circulating in your own body, and the equivalent of the 10-20 chest X-rays Americans get every year from ambient radiation. When a clerk at the photo shop saw the photo with the cans of thorium and uranium nitrate (above), I ended up having a little unscheduled talk with the police after I drove home from church. The labels visible in the photos had words like "nitrate", "radioactive", "may cause cancer", "Oxidizer. May cause fires", and so forth. They did not understand the rest of the photos either, and just wanted to know what I was doing. The next day (Monday), there was a lot of publicity about the arrest of a suspect in a radiological bomb ("dirty bomb") plot. I was actually glad that the police had already talked to me. When people have questions and concerns, try to deal with them as God deals with Christians: "If any of you lacks wisdom, let him ask of God, who gives to all men generously and without reproach . . ." (James 1:5). And some words of advice from a guy in government, namely, King Solomon: "He who keeps a royal command experiences no trouble, for a wise heart knows the proper time and procedure" and "If a ruler's temper rises against you, do not abandon your position, because composure allays great offenses." (Ecclesiastes 8:5 and 10:4). "By forbearance a ruler may be persuaded, And a soft tongue breaks the bone." (Proverbs 25:15) Keep a cool, patient head, and maybe those around you will too. And remember . . . It's an adventure! Be careful, but enjoy the wonder! 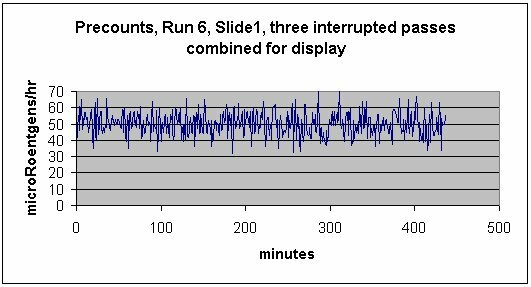 A different method was used to collect data for Run 6. The counter was started as a background counter and then the dry electrode was placed in the electrode counting fixture directly after the run and while the counter was already operating. The delay to get data was only 2 minutes instead of the usual 8. As expected, the electrode radioactivity increases with time. Later, the RM-60 was moved from the electrode fixture to the slide fixture. 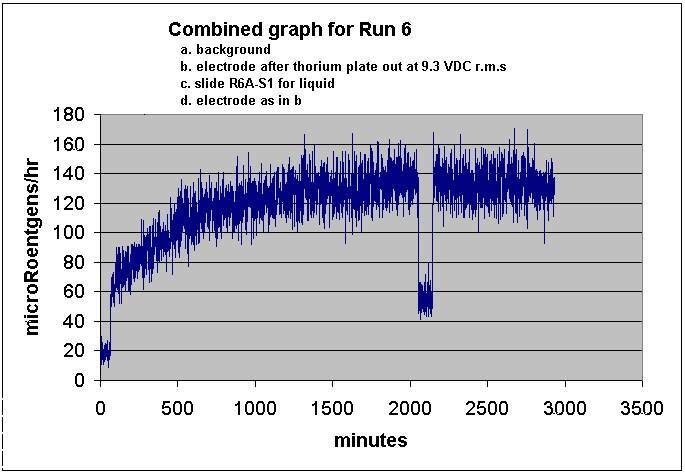 Counts on the dried liquid sample imply that quite a bit of the thorium did not plate out and is still in the liquid. The RM-60 was then transfered back to the electrode counting fixture. This scheme helps to reduce any effects of geiger tube warm up or software initialization. 1. 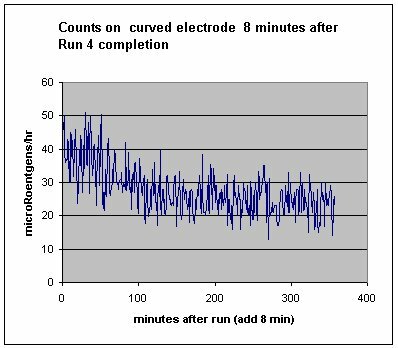 Before meaningful measurements can be made on electrodes or on a liquid, the electrolysis must be stopped. This is because electrolysis will move the radioactive ions around and change their geometrical relationship with the counter. The radioactive ions may plate out on the cathode, or they may precipitate out of the solution and settle to the bottom of the container. Or bubbles may sweep them to the top and they may stick to the sides like a bathtub ring. If you have the counter looking at an operating reaction cell, you may see a decrease (or increase) in the measured radioactivity, but this may be due to radioactive ions moving to a different location, not because there has been any basic change in radioactivity levels. 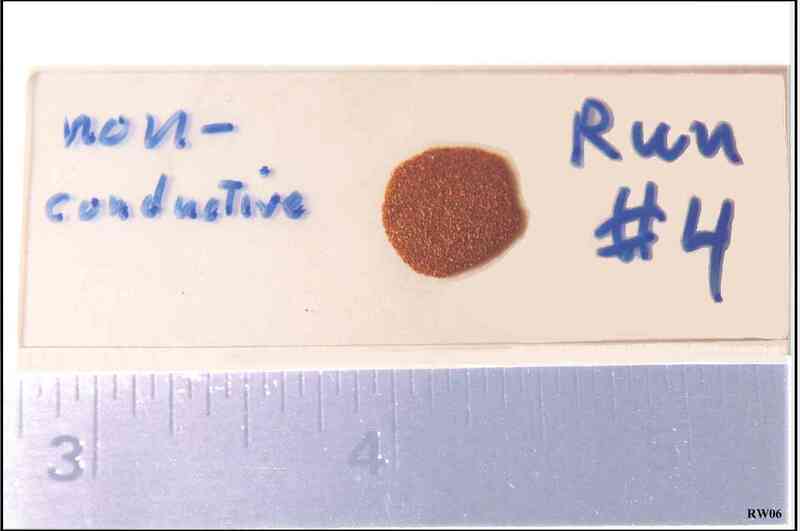 In fact, this can happen even if the cell is not energized; uranium can self-plate onto an electrode just like copper will self-plate onto an iron nail in a solution of copper sulfate. 2. The geometrical relationship between the counter and the dry electrode (or dry sample) must be fixed and stable. If the counter is looking at a portion of an electrode and then gets bumped, or moved by a wife who wants to "tidy things up a bit", then the results are going to be skewed, and may lead to an unsupportable conclusion. This is why counting fixtures are so important. Thorium and uranium are used in these experiments for safety reasons, not because people care about neutralizing the radioactivity of these very long-lived isotopes. Similarly, very short-lived isotopes are not of much concern either; the radioactivity from these materials is intense, but burns off to safe levels in just a few days, weeks, or months. The real concern is with the isotopes that have intermediate half-lives of dozens of years to tens of thousands of years. From the human standpoint, these are both intensely radioactive, and intensely persistent. Cesium 137 has a half-life of 30 years; strontium 90, 29 years; radium 226, about 1620 years; plutonium 239 and 240, about 24,000 and 6,537 years respectively. The passage of 20 half-life periods will decrease the radioactivity levels by more than a million. But you can readily see that tens of thousands of tons of this stuff is going to remain dangerously radioactive for a long, long time. That is why any simple economical process that affects radioactive half-lives is of great significance. 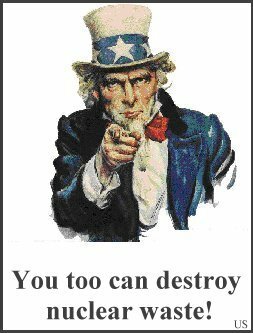 No one will care if you can change the half-life of thorium from 14 billion years to a few days, but if you could change the half-life of strontium 90 from 29 years down to a month or a week, that would have enormous scientific and economic implications. Currently, we do not know if isotopes with intermediate half-lives are more sensitive to electrolytic neutralization than long-lived isotopes. And unfortunately, experiments on these intermediate materials are far too dangerous for the amateur experimenter. Can I do the same operation with the equipment for a gamma radiating cobalt specimen and get a similar result? A time was agreed to and with Cecil’s directions and under his watchful eye I operated the equipment to try to obtain a similar result. A specimen that had a high active count was selected for the test. Equipment was checked for radioactivity and indicated background levels. The specimen was placed on the pedestal, arc gap adjusted, bell jar was greased and placed on its platform. Electrical connections were checked for the correct polarity, i.e., a negative charge (positive charge for all you electrical engineers) on the pedestal where the specimen was placed. Electrical equipment was switched on for the vacuum pump and for the electric controls to the specimen. 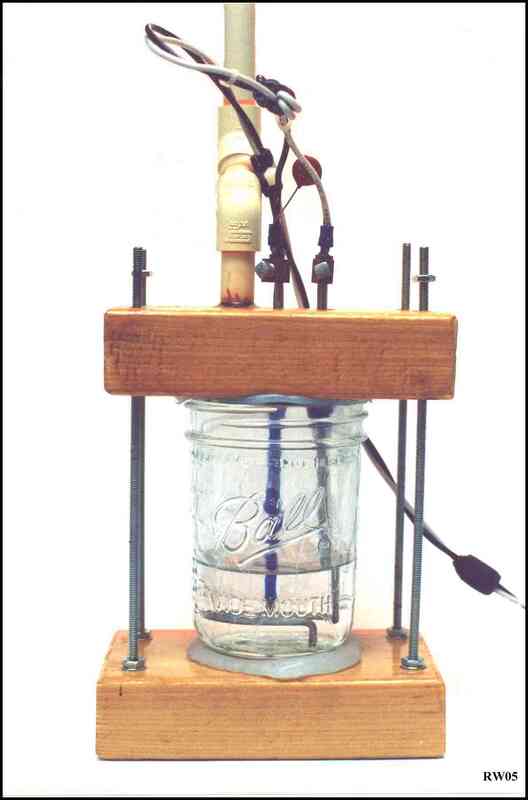 The vacuum pump had to create a reduced pressure in the bell jar for the purpose of creating an electrical arc (3000 volts maximum from the center tap transformer) and thus the heating effect on the specimen once the electrical arc was established and at the same time placing a negative electric field (less than 3000 volts when operating with the electrical arc) on the specimen for deactivation that was placed on the pedestal in the evacuated bell jar. The major concern was obtaining an adequate temperature (critical deactivation temperature) on the specimen by the electric current in the vacuum and power available from the electrical equipment, since it was limited by available electrical power current. The specimen attained a nice orange glow, probably somewhere around 2400 degrees Fahrenheit. Held at temperature for a minute or so and turned off the vacuum pump. The electric arc was then broken as the bell jar lost its vacuum. The heating stopped since the electrical arc was broken. The electrical field was maintained during cool down of the specimen. The electric field was discontinued after the specimen had cooled down and the bell jar was removed. Update 10-30-16: Another comprehensive source of information and patents pertaining to radioactivity reduction is at http://www.rexresearch.com/fukushimamour/fukushima.htm This is an excellent link; be sure to visit it (the implications are very disturbing). Additionally, the neutralization process itself produces still other elements, and apparently the various processes can be adjusted to favor particular nuclides. The tens of thousands of tons of high level radioactive waste could become a valuable resource instead of a deadly environmental hazard. Special yarn could help communities clean up radioactive waste. "The radioactive wastes from that processing were then stored at sites in North County. Tens of thousands of barrels, many stacked and left open to the elements, contaminated the soil and nearby Coldwater Creek. It's the creek that sometimes flooded the park next to the Oscko's house.
. . . Dyken and her colleagues did find distinct potential risks. For children who grew up near Coldwater Creek, or lived in its flood plain for many years in the 1960s to the 1990s, the risk of some cancers may be higher, in particular for bone and lung cancers." is tested at PNNL's Marine Sciences Laboratory. Credit: PNNL"
This method should work for any heavy metal waste (radioactive or not) dissolved in water. Radioactive material can be collected and then destroyed using the methods outlined above. The focus of the above article has been on reducing the half-lives of radioactive materials, especially nuclear waste, in order to render it safe for disposal. However, an opposite kind of technology might also be possible: a technology to extend the half-lives of radioisotopes. 1. Extending the shelf life of valuable medical radioisotopes might be possible. Technetium 99m is widely used in nuclear medicine for "functional" diagnostic medical imaging. It has a half-life of 6 hours. This is long enough for functional studies, but short enough so that the residual radioactivity is not a nuisance (people in an airliner don't like sitting next to a slightly radioactive former patient). Because of the short half-life, the Tc-99m has to be produced just before use, usually offsite in a molybdenum 99 generator. The Tc-99m, of course, decays during transport to the hospital. Costs would go down and convenience improved if such isotopes could be prepared, purified, and preserved in a special environment that makes such radioisotopes stable. 2. Studies of elements at the upper end of the Periodic Table might be possible. Elements at the upper (heavy) end of the Table from about polonium, element #84, to the unnamed element #118, show generally increasing instability. They either eject mass in the form of alpha particles, or simply split in two (fission). The ability to create and preserve such elements indefinitely would greatly facilitate studies of these heavy elements. Examining Radiohalos, R. H. Brown, H. G. Coffin, L. J. Gibson, A. A. Roth, and C. L. Webster, Geoscience Research Institute, Origins 15(1):32-38 (1988), Literature Review: Creation's Tiny Mystery, R. V. Gentry. 2nd ed. (1988). Earth Science Associates, Knoxville, Tennessee. 347 pages. The Creation Date Controversy, Dr. Hugh Ross, Ph.D.
"101 evidences for a young age of the earth and the universe"
Also, (in case you are wondering) the Bible says: "In the beginning God created the heavens and the earth." (Genesis 1:1). The time is indefinite and could easily have been millions of years or longer for the creation of the physical heavens and earth. The preparation of the (already existing) earth for habitation took six Creative Days. God rested on the seventh Day, but there is no scriptural statement that the seventh Day ever ended. On the contrary, it seems to have continued down to our time (Hebrews 4:3-6, 9), and this implies that a Creative Day is at least 6000 years long. And while we are at it, please note that the earth was worked over by water on two occasions, not one. The first was the waters of Creation, (Genesis 1:2) which probably converted the surface of the earth from a pile of rocks (like those evident on Mars and Venus) into something that was more like fine dirt. The other was the Flood of Noah's day (Genesis 7 & 8). ) Both events need to be taken into account when trying to determine the ages of rock strata. See Advanced Atomic Energy Converters and Some Thought Provoking Issues for some thoughts on how neutrinos might be involved somehow in long term elemental instabilities. they do not know what makes them stumble." " . . . when researchers suggested in August that the sun causes variations in the decay rates of isotopes of silicon, chlorine, radium, and manganese, the physics community reacted with curiosity, but mostly with skepticism." "Both experiments had lasted several years, and both had seen seasonal variations of a few tenths of a percent in the decay rates of the respective isotopes." "In those experiments, the decay rate changes may have been related to Earth's orbit around the sun, the Purdue teams says. In the Northern Hemisphere, Earth is closer to the sun in the winter than in the summer. So the sun may have been affecting the rate of decay, possibly through some physical mechanism that had never before been observed." "The closer to the sun, the denser the shower of neutrinos." "If the results are confirmed, and nuclear decay is not immutable, perhaps physicists could find a way to speed it up to help get rid of waste from nuclear power plants." In another moment of weirdness, Purdue nuclear engineer Jere Jenkins noticed an inexplicable drop in the decay rate of manganese-54 when he was testing it one night in 2006. It so happened that this drop occurred just over a day before a large flare erupted on the sun. . . .
Sure enough, the researchers noticed the decay rates vary repeatedly every 33 days -- a period of time that matches the rotational period of the core of the sun. The solar core is the source of solar neutrinos. "Radiometric Dating: Is the 'Decay Constant' Constant? ", Anderson, John Lynde & George W. Spangler (1974), Pensée, No. 4 (Fall 1974), 31-33. "Serial statistics: Is radioactive decay random? ", Anderson, J.L.and G.W. Spangler, 1973, Phys. Chem. J., 77 (26) : pp. 3114 - 3121. If "solar neutrinos impact decay rates on Earth", this should not be hard to investigate with spacecraft. Equip interplanetary space probes with matched radioactive samples and matched radioactivity detectors (appropriately shielded from everything except neutrinos). Send one to Mercury and another to Mars (or where-ever). There will be a big difference in solar neutrino flux at different distances from the Sun, and therefore a change in decay rates should be easily detected and easy to predict. Note 12-9-09: One might want to consider an astrophysical implication of the neutrino/atomic decay hypothesis. As dust particles in outer space are pulled into the Sun by its gravitation, the nuclides comprising them are subject to an evermore intense flux of neutrinos. This will cause some previously stable elements to become radioactive, and some already unstable nuclides to become even more radioactive. Once they are actually inside the Sun and have mixed with the solar material for a long time, they will presumably reach a new neutrino/atomic decay equilibrium relationship and become stable. After a very long time, the star will finally enter the supernova stage and blow itself to bits. This drastically changes the density of its matter, and the previously existing neutrino flux drops drastically in intensity too. This again upsets the neutrino/atomic decay equilibrium and may cause previously stable nuclides to again become radioactive. Supernova products like nickel 56 and cobalt 56, which have half-lives of 6.1 days and 77 days, respectively, may be the result of such a processs. Fluctuations in neutrino flux could affect the decay rates of radionuclides in the Earth. These are very dilute, but scattered throughout a body the size of a planet, and neutrinos can easily pass through an entire planet. The consequent fluctuations in radioactivity could cause the Earth to internally heat up (or cool down) slightly. Whether this has any implications for "global warming" or other geologic changes is not clear, but it is a loose end that should be given some expert consideration. "A contribution from R. Monti described the suppression of the radioactivity of thorium oxide. Monti's method was similar to the method worked on in the summer of 1992. He could reduce the activity from 900 cpm to about 100 cpm in four days of a series of sudden heatings. the extraordinary claims of Dr. Champion at: http://www.drjoechampion.com/History/x-files/neurad01.htm and Update 4-5-12 below. "Mitsubishi Heavy Industries has established technology based on a low-energy nuclear reaction concept of the transmutation of elements. For example, the transmutation of cesium was experimentally confirmed to increase, by an atomic number of four, to praseodymium, without the use of a large-scale nuclear reactor or accelerator. The company is moving from a fundamental research stage into a practical research stage. Their technology may open the path to clean nuclear transmutation technology. Mitsubishi Heavy Industries, a primary manufacturer of nuclear technology, is eager to use the technology in a practical application to convert radioactive strontium and cesium waste into harmless non-radioactive elements." "The conflict for radiometric methods is that zircons in Precambrian granite display huge helium concentrations . When the amounts of uranium, lead, and helium are determined experimentally, one finds amounts of lead and uranium consistent with more than a billion years of nuclear decay at presently measured rates. Amazingly, most of the radiogenic helium from this decay process is also still present within these crystals that are typically only a few micrometers across. However, based on experimentally measured helium diffusion rates, the zircon helium content implies a time span of only a few thousand years since the majority of the nuclear decay occurred. But just how strong is the case that radiometric methods are indeed so incorrect? There are dozens of physical processes which, like helium diffusion, yield age estimates orders of magnitude smaller than the radiometric techniques. Many of these are geological or geophysical in nature and are therefore subject to the question of whether presently observed rates can legitimately be extrapolated into the indefinite past. . . . "
Another problem that enters into the radioactive dating controversy pertains to the nature of time itself. Physicists are trying to get rid of "time" as a fundamental concept. Einstein said "...for us physicists believe the separation between past, present, and future is only an illusion, although a convincing one." For him, time was illusory. Modern physicists have been moving in that direction too, and for good reasons. They have, and are, realizing that in the equations of physics, time is not fundamental. In quantum mechanics, for instance, its use is merely parametric. In Einstein's E=mc2 equation, time does not appear separately, but only as a component of motion. Physicists believe that the use of motion, instead of time, would be more fundamental (and perhaps even easier to use). The implications are enormous and mind-boggling. For related issues, see "In Search of the Geometry of Space, Time, and Motion". The article is about a search for a metric for "distance" that the Universe actually uses (not just the theoretical ones in the textbooks); the application is space travel, and additionally "non-locality", and some other weird phenomena that are very hard to describe, let alone explain. Time is "physically" involved in these problems. "We show that cavitation of a solution of thorium-228 in water induces its transformation at a rate 104 times faster than the natural radioactive decay would do. This result agrees with the alteration of the secular equilibrium of thorium-234 obtained by a Russian team via explosion of titanium foils in water and solutions. These evidences further support some preliminary clues for the possibility of piezonuclear reactions (namely nuclear reactions induced by pressure waves) obtained in the last ten years." "Neutron emission measurements by means of helium-3 neutron detectors were performed on solid test specimens during crushing failure. The materials used were marble and granite, selected in that they present a different behaviour in compression failure (i.e., a different brittleness index) and a different iron content. All the test specimens were of the same size and shape. Neutron emissions from the granite test specimens were found to be of about one order of magnitude higher than the natural background level at the time of failure." "The group has investigated this hypothesis by embedding a number of radioactive nuclei inside metals and then cooling the metal to a few degrees kelvin. As expected, they observed a longer half-life for the electron capture of beryllium-7 and shorter half-lives for β+-decay in sodium-22 (Eur. Phys. J. A 28 251) and α-decay in polonium-210. They are now investigating the α-decay of radium-226, a hazardous component of spent nuclear fuel with a half-life of 1600 years. [Claus] Rolfs calculates that this half-life could be reduced to as little as a year and at the very least to 100 years, and believes that the half-lives of all other hazardous alpha emitters within nuclear waste could be shortened by similar amounts." "RADIUM DOPED INDUCTOR-CAPACITOR THAT MAKES NUCLEAR BATTERY"
" . . . a current is passed through the cells or batteries to be treated, consisting partly of alternating current and the remainder of direct or pulsating direct current. For charging or renewing normal commercial cells or batteries, the treating circuit can therefore include a rectifier with a very considerable leak (50-90%) or a rectifier bridged by a resistance. . . . Experiments with dry hearing aid batteries and pocket lamp batteries have shown, that by a treatment according to the invention the life of such batteries can be lengthened to 20 to 30 times the normal life." The process was originally intended for primary batteries, which were not intended to be recharged. This technology comes from the 1950s and can easily be done today, even by hobbyists (or as a science fair project). Wouldn't you like to have rechargeable batteries that last 20-30 times normal? Do you think that there would be a market for such a charger? Especially for car batteries . . .? For home power plants . . .? For exploding lithium batteries . . . ? Engineers get the first close-ups of finger-like growths that trigger battery failures. http://www.lenr-canr.org/Experiments.htm http://lenr-canr.org/wordpress/?page_id=187 Shows lots of very detailed color photographs and drawings of cold fusion cells. Also has article "High School Students Do Cold Fusion" which is about the work Prof. John Dash (Portland State University) with high school students as part of the Apprenticeships in Science and Engineering program. "High School Students Get Results With Cold Fusion Experiment"
"A cold fusion demo at MIT"
http://physics.pdx.edu/faculty_files/das/dash.htm More about Dr. Dash and his research. "Fun with fusion: Freshman's nuclear fusion reactor has USU physics faculty in awe"
The team found that unrolling tape at a relatively slow rate—just a few centimeters per second—simultaneously leads to visible light and X-ray emission from the spot that the tape separates from the roll. They showed that the X-rays are intense enough to image the bones in a finger by exposing commercial dental X-ray film to the tape-peeling apparatus for about 1 second. Further study revealed that this tribological process induces nanosecond bursts of X-rays with a peak energy of about 15 keV. "Professor Huai-Yong Zhu from QUT Chemistry said the world-first intelligent absorbent, which uses titanate nanofibre and nanotube technology, differed from current clean-up methods, such as layered clays and zeolites, because it could efficiently lock in deadly radioactive material from contaminated water. The used absorbents can then be safely disposed without the risk of leakage, even if the material became wet." "Deinococcus radiodurans is an extremophilic bacterium, one of the most radiation-resistant organisms known. It can survive cold, dehydration, vacuum, and acid, and is therefore known as a polyextremophile and has been listed as the world's toughest bacterium in The Guinness Book Of World Records. . . . As a consequence of its hardiness, it has been nicknamed Conan the Bacterium. D. radiodurans is capable of withstanding an acute dose of 5,000 Gy (500,000 rad) of ionizing radiation with almost no loss of viability, and an acute dose of 15,000 Gy with 37% viability. A dose of 5,000 Gy is estimated to introduce several hundred double-strand breaks (DSBs) into the organism's DNA (~0.005 DSB/Gy/Mbp (haploid genome)). For comparison, a chest X-ray or Apollo mission involves about 1 mGy, 5 Gy can kill a human, 200-800 Gy will kill E. coli, and over 4,000 Gy will kill the radiation-resistant tardigrade. Deinococcus has been genetically engineered for use in bioremediation to consume and digest solvents and heavy metals, even in a highly radioactive site." Goto: "Beyond Einstein: non-local physics"